Automakers have quickly recognized the popularity of pickup trucks. The segment already accounts for approximately one out of every five vehicles sold in Canada, with sales mostly limited to full-size offerings. The industry is now set to pick up some steam in the mid-size segment. Incumbent models such as the Chevrolet Colorado, GMC Canyon, Toyota Tacoma and the Honda Ridgeline will face tough competition as the market leader, Ford, reintroduces the Ford Ranger later this year. Jeep has finally revealed the Gladiator, a pickup variant of its hugely popular Wrangler SUV. It has now also been confirmed that Hyundai will be entering the segment with an all-new pickup model of its own. As the segment grows in the coming months, automakers continue to offer attractive incentives on current truck models. We’ve featured some of our favourite offers on pickups this week. If you don’t find one that suits you, be sure to check out the Globe Drive Build and Price Tool to see the latest incentives and discounts on any new car, truck or SUV. The Ford F-series held onto its titles as Canada’s bestselling line of trucks and Canada’s most popular vehicle in 2018. 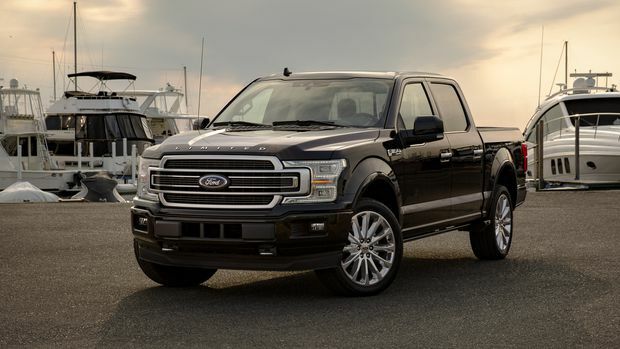 The 2019 Ford F-150 comes standard with a turbocharged 2.7-litre EcoBoost engine that delivers 325 horsepower and 400 lb.-ft. of torque, mated to a 10-speed automatic transmission. Notable features on the Lariat trim include a SYNC3 infotainment system with an eight-inch display, voice-recognition capability, Android Auto and Apple CarPlay compatibility, an available 10-speaker B&O sound system, dual-zone climate control, a leather-wrapped multifunction steering wheel, and heated and ventilated leather front seats. Its safety features include an automatic emergency-braking system, a reverse-sensing system and a rearview camera with dynamic hitch-assist. Ram is Canada’s second bestselling line of trucks. 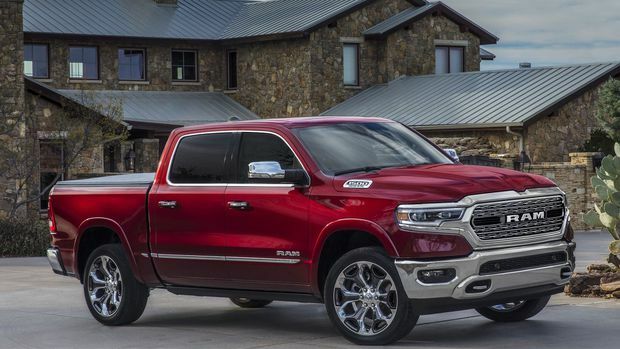 Its light duty model, the Ram 1500 was redesigned for the 2019 model year and was also named the 2019 Motor Trend Truck of the Year. However, fans of the previous generation can still get their hands on the 2019 Ram 1500 Classic while quantities last. When equipped with a 5.7-litre HEMI V-8 engine, the 2019 Ram 1500 is capable of outputting up to 395-horsepower and 410 lb.-ft. of torque. The Big Horn trim’s interior features a Uconnect 3 multimedia centre with a five-inch touchscreen, a leather-wrapped multifunction steering wheel, a rearview camera, remote engine ignition and an electromechanical parking brake. This full-size pickup truck also boasts electronic stability control technology with features such as ready alert braking, rain brake support, hill start assist, traction control, electronic roll mitigation and trailer sway control. 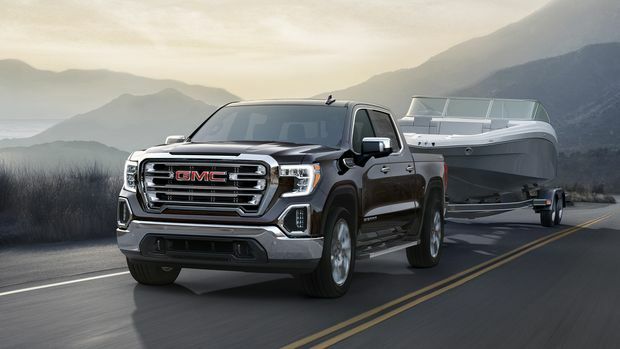 The GMC Sierra, along with its fraternal twin, the Chevrolet Silverado, are both among Canada’s bestselling truck lines, and their light duty models have been redesigned from the ground up for the 2019 model year. The previous generation model, now known as the GMC Sierra Limited, can also now be purchased along the redesigned model. The 2019 GMC Sierra SLT comes standard with a 5.3-litre EcoTec3 V-8 engine that generates 355 horsepower and 383 lb.-ft. of torque, paired with an eight-speed automatic transmission. Buyers can also opt for a 6.2-litre variant for an additional 65 horses. Its interior appointments include an eight-inch infotainment display with available navigation, dual-zone climate control, a heated and leather-wrapped multifunction steering wheel, perforated leather-appointed seating and remote engine ignition. The most notable changes on the exterior are a larger grille flanked by redesigned LED headlights with C-shaped LED signature lighting and LED fog lights. 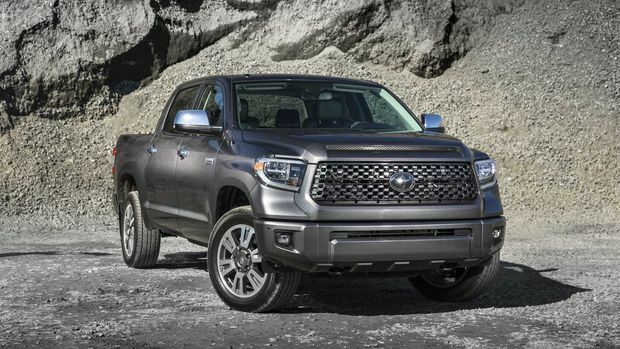 The 2019 Toyota Tundra delivers 381 horsepower and 401 lb.-ft. of torque through a 5.7-litre i-FORCE V-8 engine, mated to a six-speed automatic transmission. Highlights of the 4x4 CrewMax SR5 trim include a seven-inch infotainment display, a nine-speaker audio system, available premium navigation, heated front seats, cruise control, windshield-wiper-deicing capability and available LED headlights. All Tundra models come standard with Toyota Safety Sense, which includes a precollision system with pedestrian detection, lane-departure alert, automatic high-beam and dynamic-radar cruise control, as well as the Star Safety System, which includes smart-stop technology, vehicle-stability control, traction control, brake-assist and electronic brake-force distribution.